Alpha Catch is the fast-paced, physical way to practice letter names and sounds. 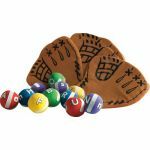 Kids take turns tossing self-stick balls, catching them with the sticky catcher's mitts, and playing fun phonics games about the letters on each ball. 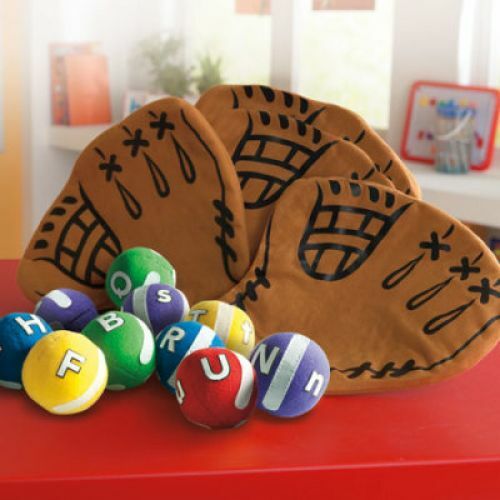 It's a phonemic awareness home run! Letter Line Up - "What letter is that?" Ace the Sound - "What sound does that letter make?" Beginning Sounds Catch - "Say a word that begins with that sound!" Ending Sounds Catch - "Say a word that ends with that sound!" Middle Sounds Catch - "Say a word that has that sound in the middle!" Word Catch - "Can you make a word with the letters you caught?"